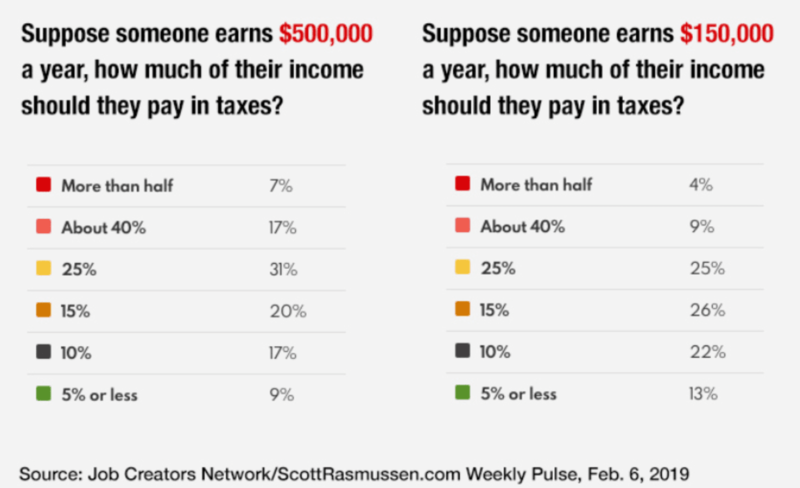 A Job Creators Network/ScottRasmussen.com Weekly Pulse poll found that an overwhelming majority of Americans are against those who make $500,000 having to pay more in taxes. 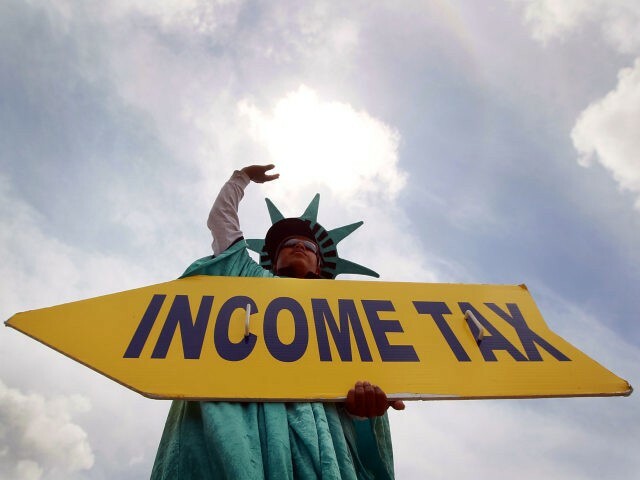 [/h2]A whopping 93 percent of respondents said a person making $500,000 a year should not be forced to pay more in taxes. The number increases to 96 percent when those polled were asked about those who make $150,000 a year. The polling numbers also found that 79 percent of Americans rated the economy as performing excellent, good, or fair under President Donald Trump. Another 79 percent said their personal finances were either excellent, good, or fair. A majority also strongly agreed that paying half of your income in taxes was too much. Job Creators Network, one of the country’s largest pro-jobs grassroots organizations, recently launched a new digital calculator that allows users to calculate the money they’ve saved over the year. The residents socialists will be along shortly to preach minimum wage and show you the errors of your ways. OK hold up... I thought that guy in the other thread said that 163% of Americans want evil rich people to be forced to give all of their earnings to the .gov. That "other" guy seems to be a lib and therefore is full of ****. yes a direct contradiction to the other "poll" that states 70% of Americans think the wealthy should pay higher taxes. Context is everything and polls can be manipulated for any desired result. Last edited by jasper711; 02-08-2019 at 09:34 AM. The forum socialists will stop in soon to post up their poll results that all workers making $80+K can afford to pay 60% taxes, and that those who cannot work due to limited skill set get the keys to our homes. Who are the idiots who think ANYONE, much less at these fairly modest income levels, should pay over 50% in taxes? Seriously......WTF is wrong with people to think that the government deserves more rewards from my hard work than I do? You people are criminally insane. It is theft, pure and simple. Anyone who supports anything in excess of a 49% tax at ANY income level should be shot in the head for treason. It is anti-American. We can argue about rates nearing 49%. We cannot argue about those in excess. They are immoral and should NEVER be allowed. The government NEVER deserves more of my money than I do. PERIOD. Those that disagree with this are free to donate more of their own voluntarily. But you cannot take mine by force. Last edited by X-ZZ4; 02-08-2019 at 10:12 AM. I'd selfishly vote for 0 but I'd also bet that at 500K the actual percentage of federal income tax over the entire 500 K is close to 25 percent for those filing joint returns and filing itemized deductions. I think the percentage of those taking the expanded standard deduction is estimated to be somewhere around 90%, post tax law changes. Those individuals topping $500k still fall into the 35% bracket, up to $600K, however. Last edited by 69L46; 02-08-2019 at 10:41 AM. Flat tax, starting at the federal poverty line, nuff said. Agree. No percentage will be enough for this blotted government. I didn’t hear much about cutting back government in the SOTU address. As I keep asking myself... name 1 govt program that works efficiently, effectively, as originally intended, and without self-perpetuation. The private sector can do many of our current govt functions and do it better, faster, and less wasteful. That is a fundamental and an outer (upper) limit. Not being able to keep (that is, to decide on my own where it's spent) half of my income violates every notion of "fairness" I can imagine. Who are the idiots who think ANYONE, much less at these fairly o income levels, should pay over 50% in taxes? Because leftists are programmed to think that somebody who makes a lot of money did it by ripping off "the little guy" and is therefore a bad person. There are tens of millions of ignorant idiots out there that believe wealth is a zero sum game. They believe that if you have an extra dollar, somebody else must have one less dollar. They think the wealthy are hording all the income, and thus are obsessed with the "income gap" even though the more money wealthy people make, the more overall tax revenue and the better it is for everybody. They'd rather the top be brought down than the bottom be brought up with increased tax revenue. It's envy. Last edited by Vitoc; 02-08-2019 at 02:40 PM. My income is far below the $100k mark yet I do NOT feel that higher income wage earners should pay extreme taxes. Better is for the Fed. to cut spending.